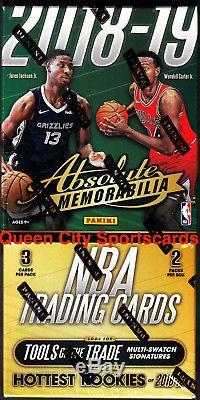 2018/19 Panini Absolute Memorabilia Basketball Factory Sealed Hobby 10 Box Case. Thank you from Queen City Sportscards. Configuration: 10 boxes per case. PRODUCT HIGHLIGHTS - The popular Uncirculated base cards are back. Get two per box, one veteran and one rookie. Absolute Memorabilia brings even more on-card designs this year with the addition of the Hoopla Signatures and 10th Anniversary Auto sets. Chase the Tools of the Trade Three, Four, and Six Swatch Signatures set, featuring 30 of the top Rookies of the 2018-19 class. Back again are the Glass cards, featuring 25 of the top NBA players and newest additions to the league. BOX BREAK - 2 Autographs - 2 Memorabilia Cards - 2 Uncirculated Cards (1 Veteran And 1 Rookie). TOOLS OF THE TRADE Collect Tools of the Trade Signatures three ways. Each card showcases an autograph and either three, four, or six swatches of memorabilia, featuring combinations of jerseys, hats, and basketballs. AUTOGRAPHS Look for even more On-Card Autographs from Absolute Memorabilia this year with the addition of the Hoopla Signatures and 10th Anniversary Auto sets. UNCIRCULATED Collect the whole 100-card Uncirculated base set. New to the Uncirculated Base set this year are the Gold #d/10. If you do not receive the per case hits described above, you must directly contact Panini for replacements, as there is nothing I can do once the case has been opened. Please contact me for any additional information or photos. The item "2018/19 Panini Absolute Memorabilia Basketball Factory Sealed Hobby 10 Box Case" is in sale since Sunday, November 4, 2018. This item is in the category "Sports Mem, Cards & Fan Shop\Sports Trading Cards\Basketball Cards". The seller is "qcsportscardsnet" and is located in Charlotte, North Carolina. This item can be shipped to United States, Canada, United Kingdom, Denmark, Romania, Slovakia, Bulgaria, Czech republic, Finland, Hungary, Latvia, Lithuania, Malta, Estonia, Australia, Greece, Portugal, Cyprus, Slovenia, Japan, China, Sweden, South Korea, Indonesia, Taiwan, South africa, Thailand, Belgium, France, Hong Kong, Ireland, Netherlands, Poland, Spain, Italy, Germany, Austria, Bahamas, Israel, Mexico, New Zealand, Singapore, Switzerland, Norway, Saudi arabia, United arab emirates, Qatar, Kuwait, Bahrain, Croatia, Malaysia, Brazil, Colombia, Panama, Jamaica, Barbados, Bangladesh, Bermuda, Brunei darussalam, Bolivia, Ecuador, Egypt, French guiana, Guernsey, Gibraltar, Guadeloupe, Iceland, Jersey, Jordan, Cambodia, Cayman islands, Liechtenstein, Sri lanka, Luxembourg, Monaco, Macao, Martinique, Maldives, Nicaragua, Oman, Peru, Pakistan, Paraguay, Reunion, Viet nam.